Come stroll or ski the paths along the Yellow River and enjoy the diverse beauty of Forts Folle Avoine Historical Park. The cross-country ski trail is open. Parking is available outside the gates near the trail head. The trail circles around the perimiter of the 80-acre park, going through the Ojibwe Village and past the Fur Posts. 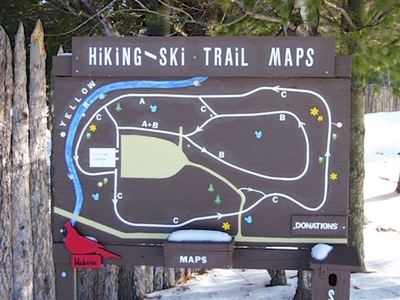 A separate snowshoe trail was developed this winter that starts at the trail head outside the gate and travels west to the river and follows the river past the Fur Posts and Ojibwe Village, ending in the Primitive Camping area. Plans to continue the snowshoe trail through the remainder of the park to create a full circle are being created. Please do not snowshoe or hike on the ski trail! ​When there is no snow, hiking is allowed on both trails.